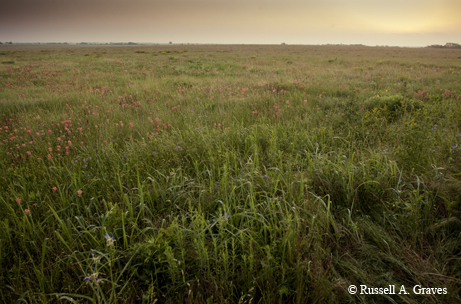 ﻿Texas has lost most of its prairie, but pockets of grassland are preserving diversity. Before the sun even rises, Tridens Prairie is already waking up. Frogs creak and groan in the subtle light of dawn, trying their best to attract a mate and multiply while conditions are optimal. Flitting across the top of the vegetation are birds I cannot identify at first. It’s not until one lands in a nearby tree and starts to sing that I realize it’s a dicksissel. Its warbling song penetrates the still, humid morning. 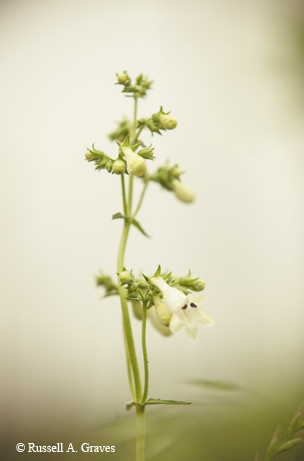 Tridens Prairie isn’t necessarily all that pretty by conventional measures. To the untrained eye, it looks like a tangle of weeds or an old farm field that’s been left fallow. The beauty of this place, however, is in the diversity of plants that populate the 97-acre patch of ground that’s never been turned over by a plow. In all, more than 170 species of plants are documented as growing on this unassuming piece of prairie. Just a couple of hundred yards to the north and separated from Tridens by U.S. Highway 82, the vast Smiley-Woodfin Prairie meets it southeastern terminus at FM 38. Heading west and north from this intersection is a vast sea of waist-high grasses interrupted only by tree-lined draws that drain water off the prairie. According to the historical marker that lies along Highway 82, this property is the largest piece of Texas tallgrass prairie that’s never been plowed. It’s cut each year for hay production and burned periodically as part of a prescribed management practice, but it’s never been turned by a plow. The Great Plains is a huge swath of land that incises mid-America from northeastern Mexico to the southern Canadian provinces of Alberta, Saskatchewan and Manitoba. The Western Great Plains runs through arid landscapes where sediment from the Rocky Mountains have flowed for eons. With scant rainfall, the prairie grows short there. On the eastern side of the Great Plains — where rainfall measures up to 40 inches per year — the grass grows tall. “Of all America’s vanished wilderness, no part has suffered and declined as much as the prairie,” the Boston Globe lamented in a 1970 editorial. 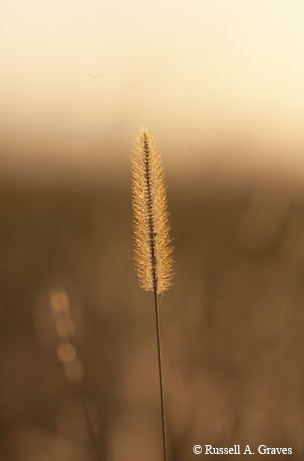 When the early settlers arrived, there were 140 million acres of tallgrass prairie nationwide. The ecosystems of Texas and Oklahoma (Cross Timbers and Southern Tallgrass Prairie) included 49 million acres of that total. Today, nearly 99 percent of the original prairies are gone. The Tallgrass Prairie Preserve (in Oklahoma and Kansas) is the largest protected remnant of tallgrass prairie left in the world. The elements that make the grass grow so tall — the rich soil, abundant rainfall, ample sunshine, temperate climate and moderately sloping topography — also make it attractive for development. White says that he believes the greatest risk to existing prairies is the conversion of grasses into improved forage for agriculture and residential/commercial development. According to White, those small patches are scant now and becoming more rare every day. Knotroot bristlegrass at Clymer Meadow. Despite the bad news, acres of pristine prairie do remain. Sixty miles northeast of Dallas, nestled between Blue Ridge and Celeste, are a couple of places of ecological significance. Collin County-owned Parkhill Prairie and the nearby Nature Conservancy easement, Clymer Meadow, protect some of the last remaining pieces of tallgrass prairie left in the state. The two parcels protect more than 1,400 acres of prairie that have never been developed or turned by a plow. One fall day, Jim Eidson of the Nature Conservancy and I walk through the grass. Historic drought conditions have desiccated the grasslands, but botanical diversity is still evident. Maximilian sunflowers are shedding their seeds after a lackluster fall bloom, and many of the seasonal grasses are far past their peak. By conventional measures of natural beauty, most would probably think that the prairie isn’t too impressive. To the uninitiated it appears to be not much more than an overgrown field. That seems to be part of the problem. Even though beautifully sublime, prairies generally lack the monu-mentalism of other natural features. A prairie’s beauty is more microscopic. Eidson helps me see the beauty of the details. Within the gilgai, I see the obvious difference in soil color — darker and perhaps richer in organic matter. Grasses like Eastern gamma (a moist-soil-loving tallgrass) grow in these depressions. Even though far away from permanent water, crayfish stools are evident in the low spots. This is such a specialized habitat, a species of crayfish unique to just these prairies exists here. Even in drought, Eidson sees the potential for prairies to conserve and replenish groundwater, which in turn benefits nearby reservoirs that supply drinking and industrial water to the Dallas/Fort Worth Metroplex. In prairie-covered open spaces, the land holds water like a sponge instead of letting it run off into creeks, carrying sediment with it. Without this benefit, the area becomes flashy, meaning that the status of most Blackland Prairie streams is either “raging torrent” or “bone dry.” Eidson says he thinks these dry creeks were once constantly flowing, but the disappearance of the prairie disrupted the area’s hydrological system. Even though much of the prairie Eidson and I walk across consists of knee- to waist-high grasses, two-thirds of the prairie’s biomass, an estimated seven tons, lies beneath the surface. Eidson explains that the average root depth is 6 feet, up to 20 feet for some species. The variety of grass and forb species is important for the soil’s water absorption capabilities. “Each year, a large portion of this root mass dies off and is replaced, providing micro and macro channels through the soil for water to move,” Eidson says. He explains to me that this life/death plant cycle increases the organic matter in the soil, helping it act like a sponge and retain water even during the heaviest rainfall events. ﻿ Beardtongue at Tridens Prairie. A couple of weeks after my first visit, I am again with Eidson at the Clymer Meadow. This time, however, we listen to a controlled burn expert who gives us a safety briefing. In my fire-resistant, high-visibility clothing, I am flanked by biologists from the Texas Parks and Wildlife Department and local firefighters who, like me, listen intently to the fire manager’s last-minute instructions. Within just a few minutes, one of the fire technicians lights up a diesel-fueled drip torch and walks along the northeastern edge of one of the prairie paddocks. The October grass is summer cured and makes efficient tinder. Once the first flames from the torch touch the ground, fire roars from the dried grass, and white smoke fills the northeastern Texas sky. Even as the prairie burns and leaves the ground bare, it won’t be long before fresh shoots of green grass begin to emerge from the charred field. The burn/regrow cycle is part of the rhythm of the prairie. “All of the tallgrass prairie, from the coast of Texas to southern Manitoba, is a fire disclimax,” Eidson says. Fire disclimax is a term used to describe an ecosystem being perpetually maintained in an early stage of succession by humans. Although the fire history for the region is unclear, Eidson believes that historically, Native Americans used fire as a tool to manage wild herds of bison. Without fire, Eidson says, the prairie quickly succumbs to brushlands, and given the amount of rainfall in the area — about 40 inches a year — the successional forces are rapid. As the fire burns in a steady and predictable manner, I follow along with the fire crews as they monitor the burn. In places, the flames reach as high as 10 feet or more and crackle with a sound that is sharper and more urgent than in the wood fires that I am accustomed to hearing. While the fire creeps to the southwest, crews on the other side of the meadow light another fire that is headed northeast into a scant early-October breeze. The idea is that the fires will eventually meet in the middle, thus completing the controlled burn and increasing the grass output and diversity come spring.